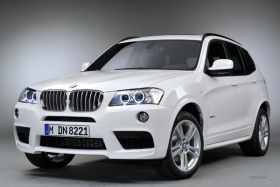 BMW sold 27,793 units of the new X3 in the U.S. last year -- a fourfold gain over the 6,075 X3s it sold in 2010. DETROIT -- General Motors Co., already targeting BMW with a new compact car, is considering a compact SUV to compete against the German automaker's X3. "We're looking at options there," Kurt McNeil, Cadillac's vice president of sales, said Tuesday in an interview at the Detroit auto show. "I think it would go a little bit more head-to-head with like the X3." GM is trying to boost sales for Cadillac with smaller models than those of BMW, which wrested the U.S. luxury sales lead from Toyota Motor Corp.'s Lexus in 2011. GM on Sunday introduced the Cadillac ATS sedan to take on BMW's 3 series and the Mercedes C class. A small luxury SUV might build on Cadillac's gains from the larger SRX SUV, which increased U.S. sales 11 percent last year. BMW's redesigned X3 helped the company displace Lexus, which had held the top ranking among luxury brands in the U.S. for 11 years. GM hasn't decided yet on a small Cadillac SUV, McNeil said. "The fact that Cadillac is becoming more of a global brand will certainly play a role in that decision," he said. Cadillac's new ATS sedan is scheduled to go on sale in the third quarter.